We would like to notify that Khun Mae’s father, Mr Siri Katekaew has passed away peacefully on 25 March 2015 at about 12.45pm. He was 83 years old. Cremation ceremony would be held on 1 April 2015. 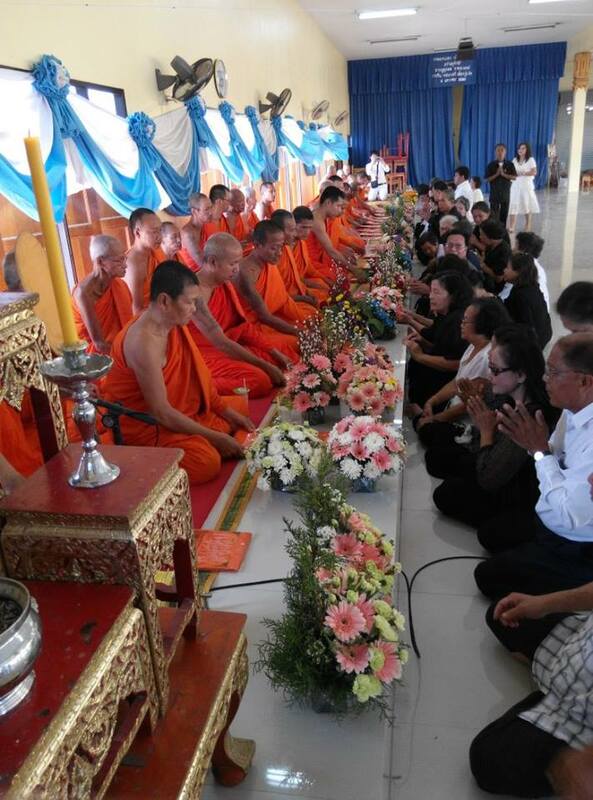 Above: 29 March 15- Monks were invited to perform chanting. 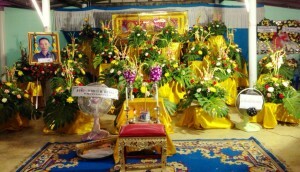 Above: Offerings of robes to monks on the cremation date. 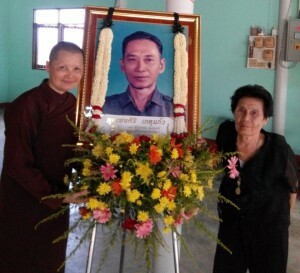 Above: Photo with Khun Mae and her mother. Above: Offering to monks before the creamation ceremony. 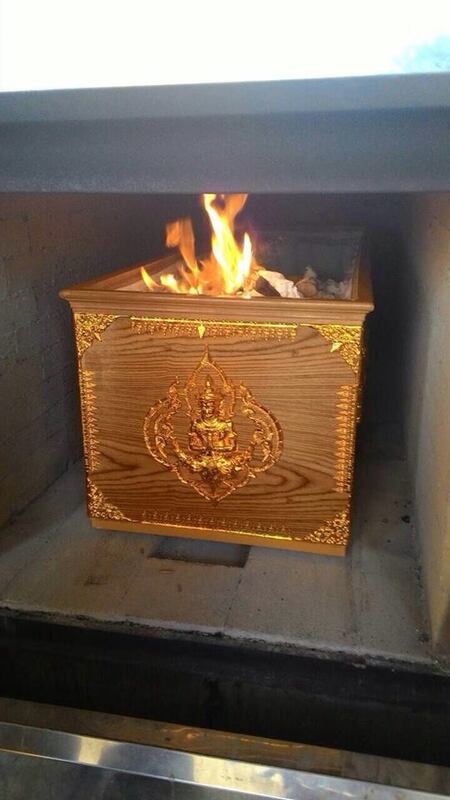 A part of Mr Siri’s ashes are kept in an urn and the rest spread out to the sea. 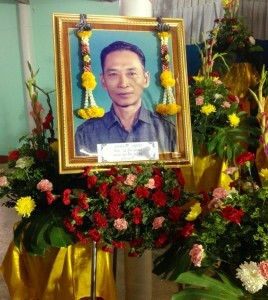 Khun Mae’s father, as we affectionately known as Phor (meaning father in Thai) had always been kind and helpful. 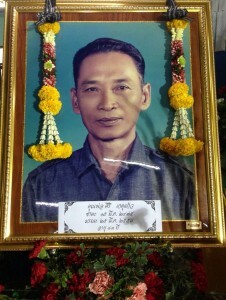 Working hard all his life- he planted fruits like longan, mangos and grapes. 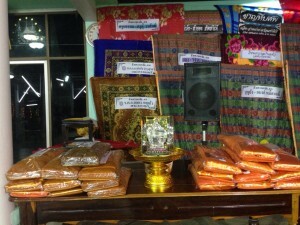 As he came to age, he donated part of his land to Khun Mae to build a temple to enable those who wishes to observe precepts to perform their practice. 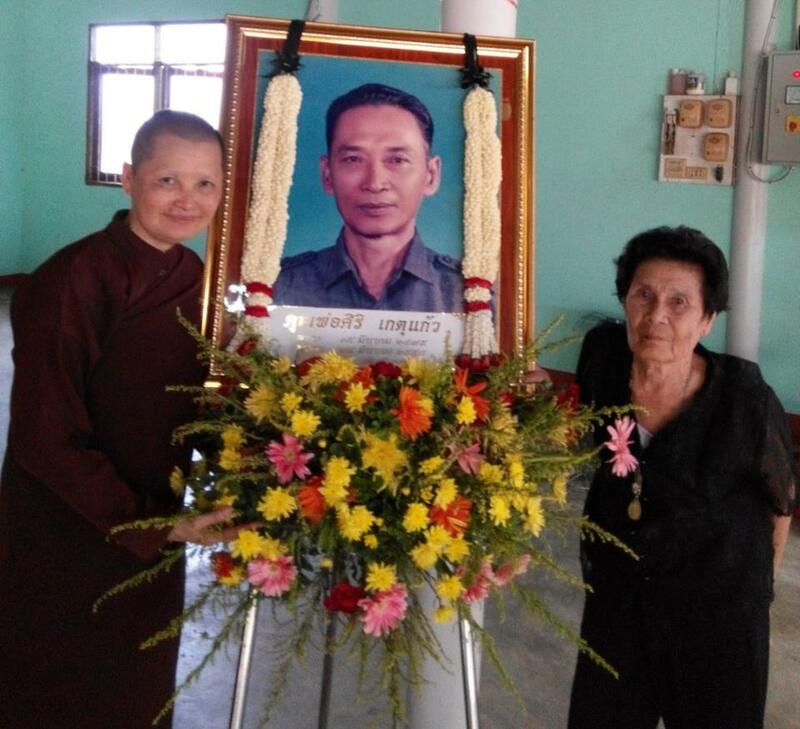 Throughout the 20 years of Khun Mae being ordained, she has helped many people- and she has always emphasized the importance of caring for one’s own parents. She took her own advise to heart and turned back to help her parents. You may read more about Khun Mae’s father here or in Mandarin. During these past few years after setting up Samathidhammaram Centre, Khun Mae was able to inspire her father towards Dhamma practice. 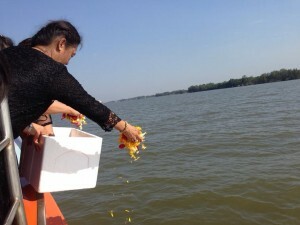 When in the past her father would occassionally invite monks for dana in line with Buddhist tradition, after Khun Mae set up the temple, her father had connected and developed a better understanding as he was involved in helping out during ordination process and was there to see participants’ practice. Even though there is a language barrier between overseas participants- Phor spoke only Thai whilst participants mostly spoke either English or Mandarin…. the language of the heart know no barriers. He had been deeply touched and inspired by the participants – who despite leading hectic lives would want to come all the way to practice observing 8 precepts or undergoing ordination. Hence he tried his level best to help and he would be seen assisting monks in the hair shaving process, offering fruits from his own plantation for meals and for participants to take back, etc. During the end of 2014, Phor had been unwell and eventually was diagnosed with lung cancer- which had spread to other parts of his body. In the 2014 ordination, participants had visited Phor a few times to offer moral support and encouragement. Thank you for all your support, concern and encouragement throughout this time. As life itself is impermanent, do not neglect our practice or observance of precepts. 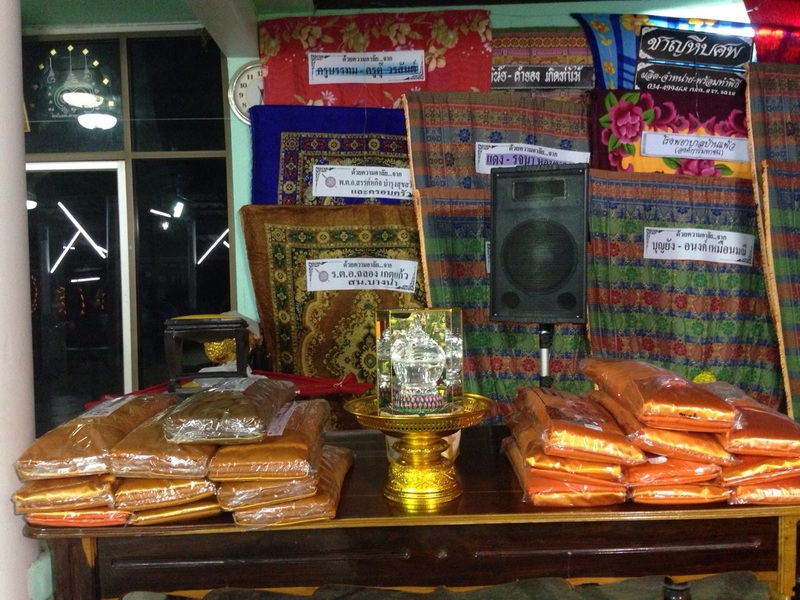 Phor had donated the land, earned through years of hard labor and sweat to provide an opportunity for those to practice the Dhamma in Thailand. May Samathidhammaram Centre would inspire many to come and practice- honoring Phor’s kind intention…. at the same time helping one throughout the journey of life that is constantly filled with uncertainties with ups and downs. Khun Mae has always advised us- when it is time to leave this earth, no matter how rich we are, we could never take our wealth with us. The only good thing we could take is our merits- borne from doing good, observing precepts. 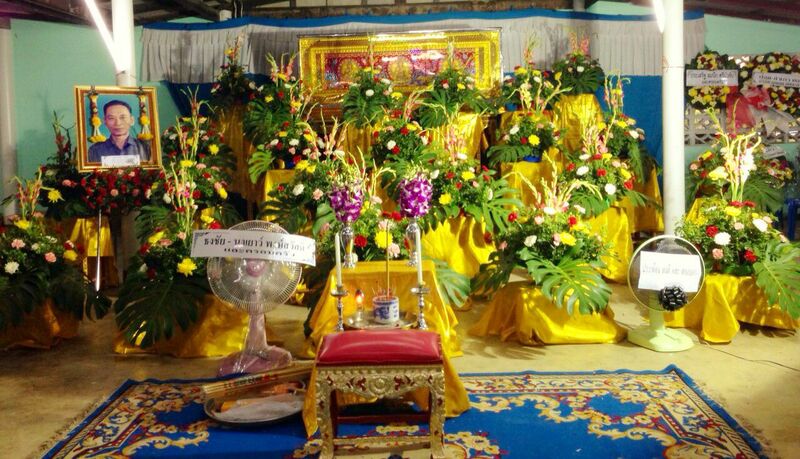 A chance to ordain yields tremedous benefits if one does it with sincerely and preserverance. Why I do good but only get bad results…while those who do bad prosper?